This little box is designed to fit up to 4 in number on your belt. 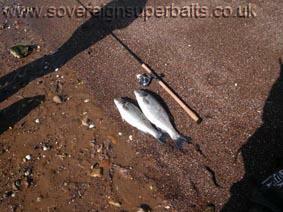 Great for live bait when wading or rock hopping. Keeps live bait cool, fresh and within reach, whether you are using live peelers, rag , lug, prawns or whatever. The vents allow air to circulate when out of the water & water to circulate when wading, they can be worn on your belt over your waders for ease of access. For rock hopping & general fishing when you intend to stay out of deep water & keep them dry they can of course be used for all sorts from spare weights to your lunch. When used in conjunction with our "chest pack", you will be amazed just what you can fit in these two great products, with no need to carry a bag as everything you need is about your person. "Belt mate" attaches to any belt up to 2 1/2” wide. 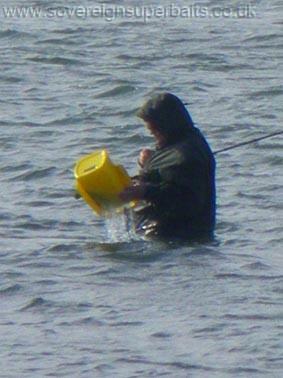 This bucket was designed 30+ years ago to drag along behind your boat / kayak to keep your livebaits (be they live fish, prawns, sand eels etc) in pristine condition. No need for an air pump as the water circulates all the time you are pulling it along. When you stop the bucket stands up like a self cocking float. "Stabilising keel" design keeps bucket upright no matter how it hits the water. Flow-through holes keep bait alive longer. Mounting holes provided for attaching a battery-operated aeration pump when moving from place to place at high speed or transporting live bait to and from the boat. Easy opening door for one hand operation which is held shut while being towed by a kevlar spring, therefore nothing to rust or corrode. This piece of kit has been on the market since the late 70's, copied many times but never bettered. 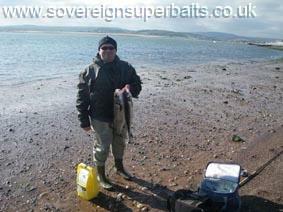 As you can see from the adjacent pictures which were sent in by a customer this bucket is also a must when wading and targeting bass from the shore. Please note, the postage quoted for all buckets is 3 to 5 working days delivery on UK mainland. Next working day delivery, Highlands & Islands, please telephone for details. Please note these buckets will cost around £20 to post to Europe and £48 to ship to the USA. This is the new 2017 Flote rite bait bucket for pulling along behind your boat / kayak. In this particular guise, Flambeau make it for several other companies & it is known by many other names like:- "Turbo Troll", Frabil "flote troll", Challenge "bait lagoon" & many others. A bungie cord is also recommended for kayak fishing especially if using on a surf beach where the bucket could be exposed to great stresses in the surf.